The relative importance of four different dissolved iron (Fe) sources in the North Atlantic Ocean have been precisely determined for the first time thanks to GEOTRACES. 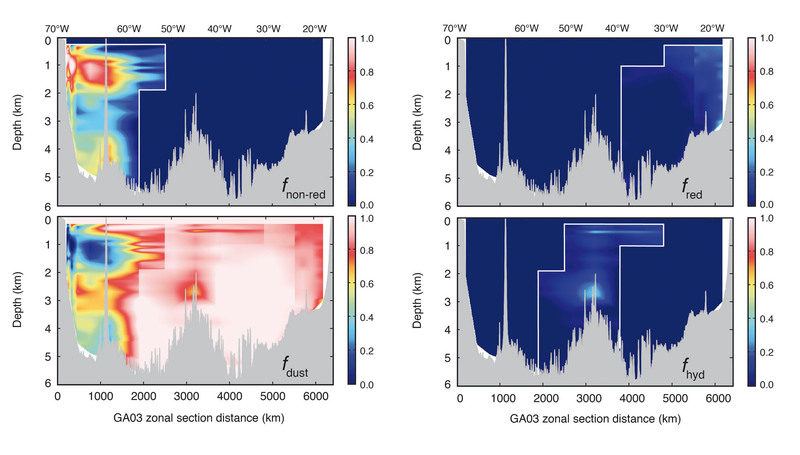 Using a novel method based on the stable isotopic composition of dissolved Fe, Conway and John (2014, see reference below) have "fingerprinted" different sources of Fe along a section in the North Atlantic Ocean (GEOTRACES GA03 section). This has allowed the scientists to determine precisely the relative contribution of these sources to the North Atlantic Ocean. They found that the dominant sources were Saharan dust, which contributes 71-87 per cent of dissolved iron, followed by North American margin sediments (10-19 per cent). Smaller contributions were observed from the African margins (1-4 per cent) and hydrothermal venting at the Mid-Atlantic Ridge (2-6 per cent). Since Fe is an essential marine micronutrient for phytoplankton, the scarcity of dissolved Fe in surface waters limits biological productivity over much of the oceans. Thus, changes in Fe inputs from different dissolved Fe sources have important implications for patterns of marine productivity and the global carbon cycle. This study therefore represents a significant contribution to our understanding of how dissolved Fe may influence past and future global change. Figure: The figure shows the fraction of the seawater-dissolved Fe across the GA03 North Atlantic section that originates from each of four distinct sources : 1. Fe from oxygenated sediments on the North American margin (fnon-red); 2. Fe released by dissolution of atmospheric dust (fdust); 3. Fe from reducing sedimentry porewaters on the West African Margin (fred); and 4. Fe from hydrothermal venting on the Mid-Atlantic Ridge (fhyd). Click here to view it larger. Tim M. Conway, Seth G. John (2014) Quantification of dissolved iron sources to the North Atlantic Ocean, Nature. doi:10.1038/nature13482. Click here to access the paper.